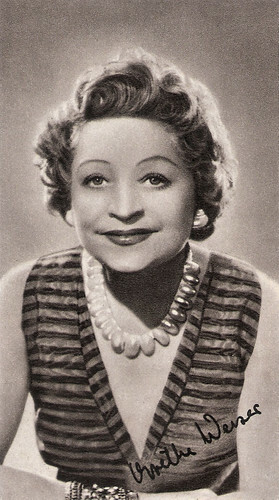 Grethe Weiser (1903–1970) was a German singer, comedian, film and stage actress, who made more than 140 films. She often played important supporting roles, portraying cooks and other household personnel, and dazzled her fans with her cunningly sharp tongue. Grethe embodied the type of the Berlin woman, known for her big heart and even bigger mouth, who was nobody’s fool and nobody’s victim. With her sassy, offhanded quick-wittedness, she was able to elicit thunderous applause from her audiences. Austrian postcard by Verlag Hubmann, Wien, no. 3389. Photo: publicity still for Der Onkel aus Amerika/Uncle from America (Carl Boese, 1953). West-German postcard by Ufa, Berlin-Tempelhof, no. FK 1054, 1957. Photo: Arthur Grimm / H-D Film / Constantin Film. Publicity still for Die Sieben Kleider der Katrin/The Seven Clothes of Katrin (Hans Deppe, 1954). West-German postcard by Kunst und Bild, Berlin, no. A 1141. Photo: Arthur Grimm / H-D Film / Constantin Film. Publicity still for Die Sieben Kleider der Katrin/The Seven Clothes of Katrin (Hans Deppe, 1954). Grethe Weiser was born Mathilde Ella Dorothea Margarethe Nowka in Hanover, Germany, in 1903. Her parents were well-to-do entrepreneurs. She spent her childhood in Kotsche and Dresden. In 1920, she escaped from her dominant and sometimes violent father by marrying Joseph Weiser, a Jewish-Austrian sugar producer. She engaged in a hunger strike to win her parents’ permission to marry him. Her only child, their son Günther, was born in 1922. In the course of the depression, however, Josef lost his fortune, and the family moved to Berlin. to try their luck there. 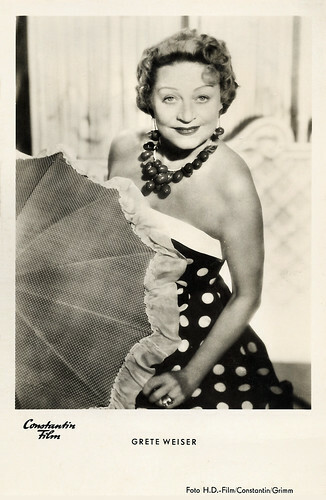 By the time her marriage had deteriorated on account of Josef’s many affairs, she had already found her calling as an actress and cabaret artist. Quite quickly Grethe established herself in the Berlin cabaret scene, especially after her husband became a leaseholder of Cabaret Charlott, a nightclub on the Kurfürstendamm. Grethe rehearsed there, and played for the first time at the famous Wintergarten and at the Cabaret der Komiker. She made her film debut in Männer vor der Ehe/Men Before Marriage (Constantin J. David, 1927), where she played a mate. In the next years, she mainly appeared in smaller roles. Her first bigger part was in the comedy Schützenkönig wird der Felix/Bashful Felix (Carl Boese, 1934) starring Rudolf Platte and Ursula Grabley. Her husband decided to leave Germany because he was Jewish and so not destroy the career of his wife. In 1934, their marriage was dissolved. 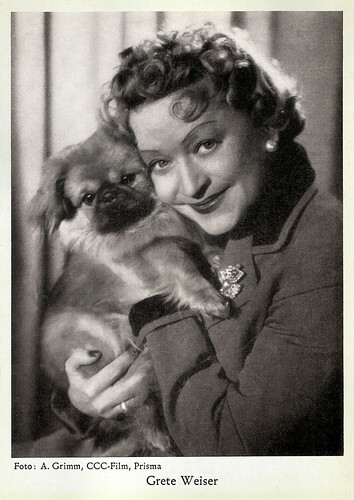 Later that year, Weiser began a lifelong relationship with Hermann Schwerin, an Ufa film producer. However, the couple were not married until 1958. Weiser avoided becoming a member of the Nazi Party. Mechthild Winkler-Jordan at FemBio: "She refused to do this, however, sent her son to boarding school in England (Josef had already fled to the Netherlands), and was miraculously left in peace. " 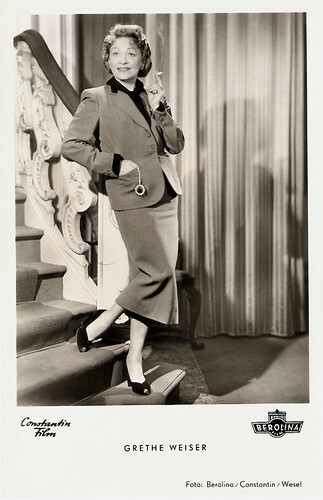 Weiser played supporting parts in such films as the drama Einer zuviel an Bord/One Too Many on Board (Gerhard Lamprecht, 1935), starring Lída Baarová. 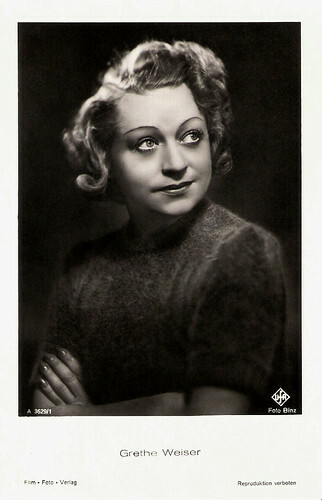 She also played the female lead in the comedy Hilde und die vier PS/Hilde and the Volkswagen (Heinz Paul, 1936) opposite Ludwig Manfred Lommel. 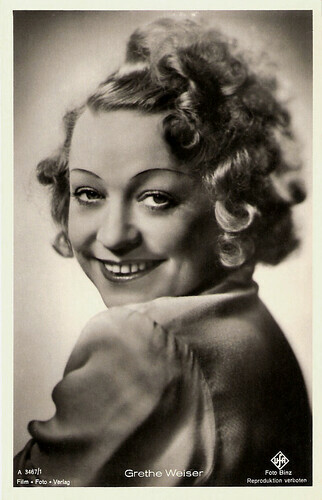 She also co-starred with Renate Müller and Georg Alexander in the romantic comedy Eskapade/Escapade (Erich Waschneck, 1936). 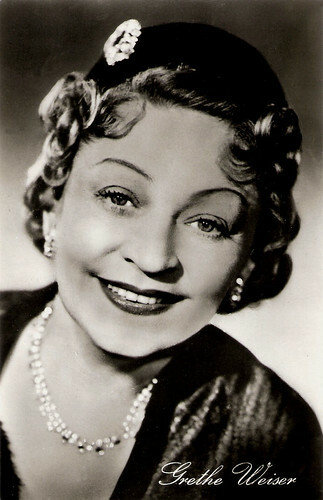 Weiser was a star now, and she had hits with successful chansons like Der Vamp and Emils Hände. 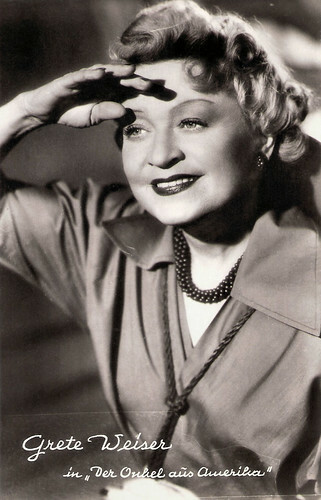 She played the title roles in the comedies Meine Freundin Barbara/My Friend Barbara (Fritz Kirchhoff, 1937) and Die göttliche Jette/The Divine Jetta (Erich Waschneck, 1937) with Viktor de Kowa. 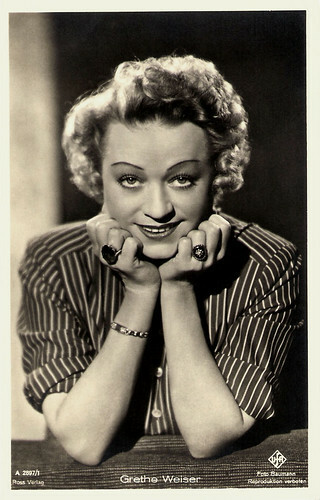 She played a supporting role in the drama Frauen für Golden Hill/Women for Golden Hill (Erich Waschneck, 1938) starring Kirsten Heiberg and Viktor Staal. 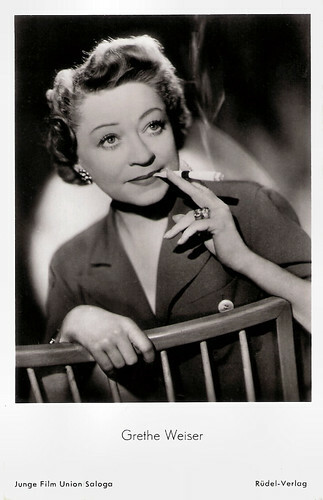 She also played a supporting part in the last German film with Lilian Harvey, the romantic comedy Frau am Steuer/Woman at the Wheel (Paul Martin, 1939). Big German card by Ross Verlag. Photo: Ufa / Hämmerer. 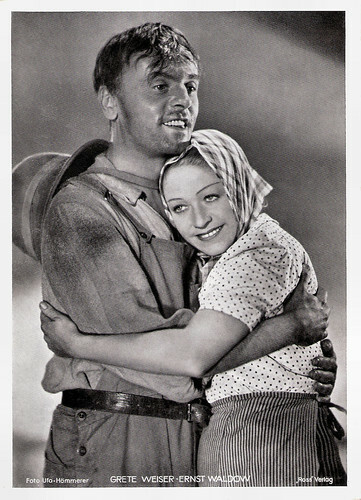 Publicity still for Frauen für Golden Hill/Women for Golden Hill (Erich Waschneck, 1938) with Ernst Waldow. German postcard by Ross Verlag, no. A 2897/1, 1939-1940. Photo: Ufa / Baumann. German postcard by Film-Foto-Verlag, no. 3467/1, 1941-1944. Photo: Ufa / Binz. German postcard by Film-Foto-Verlag, no. 3629/1, 1941-1944. Photo: Ufa / Tita Binz. 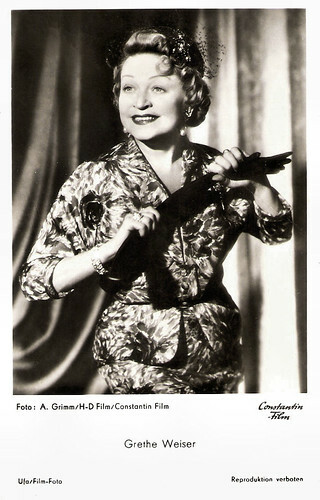 During the war years, Grethe Weiser played supporting roles in films like the musical Wir machen Musik/We Make Music (Helmut Käutner, 1942), starring Ilse Werner and Viktor de Kowa, and the drama Familie Buchholz/The Buchholz Family (Carl Froelich, 1944), starring Henny Porten. After the war, she had a small part in the third DEFA film, Irgendwo in Berlin/Somewhere in Berlin (Gerhard Lamprecht, 1946), which sold 4,179,651 tickets. It was one of the Trümmerfilms (rubble films) made in the aftermath of the Second World War and dealing with the impact of the battles in the countries at the centre of the war. The style is characterised by its use of location exteriors among the ‘rubble’ of bombed-down cities to bring the gritty, depressing reality of the lives of the survivors in those early years. Mechthild Winkler-Jordan at FemBio: "In 1948 Grethe met Ida Ehre, proprietor of Hamburg’s Studio Theatre Kammerspiele, who offered her the leading role in Das Kuckucksei (The Cuckoo’s Egg). The premiere brought Weiser tremendous ovations, and she frequently went on tour with this piece. Cooperation with Ida Ehre on Hauptmann’s Der Biberpelz (The Beaver Coat) where she played Mother Wolffen, deepened their contact, which eventually developed into a close friendship." In the Wirtschaftswunder cinema (the cinema in the the era of the 'economic miracle' following the war), Weiser was the star of Morgen ist alles besser/Everything Will Be Better in the Morning (Arthur Maria Rabenalt, 1948), with Ellen Schwanneke and Jakob Tiedtke. She next appeared in the hit Tromba (Helmut Weiss, 1949), an Italian-West German Circus film with elements of Film Noir. It’s success suggested that audiences supported a shift away from the Trümmerfilme. Another success was Gabriela (Géza von Cziffra, 1950), starring Zarah Leander. It was Leander's comeback film after a seven-year absence from filmmaking, and Weisser appeared in a supporting role. During the 1950s, Weiser starred again in a series of West-German comedies. Examples are Wenn Männer schwindeln/When Men Cheat (Carl Boese, 1950|), the cross-dressing comedy Fanfaren der Liebe/Fanfares of Love (Kurt Hoffmann, 1951) starring Dieter Borsche and Georg Thomalla, Der keusche Lebemann/The Chaste Libertine (Carl Boese, 1952) again with Georg Thomalla, and Die Kaiserin von China/The Empress of China (Steve Sekely, 1953) with Nadja Tiller. Most of her films were comedies, happy humour films, full of heart. Among her best films are Der Onkel aus Amerika/Uncle from America (Carl Boese, 1953) opposite Hans Moser, and Casino de Paris (André Hunebelle, 1957) as the mother of Caterina Valente. 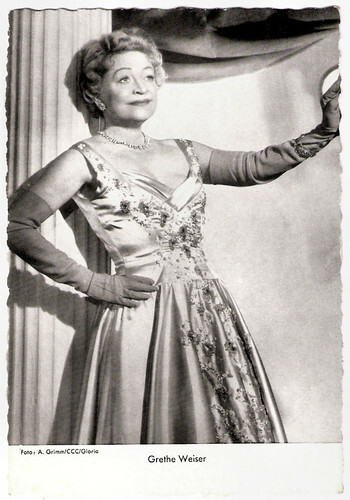 In 1960 she played on stage in Hamburg and in Berlin an der Komödie am Hebbel and at the Renaissance Theater. In 1968 she got a Verdienstkreuz (Cross of merit) from the German President. Two years later, Grethe Weiser died in 1970 after a road accident in Bad Tölz in Bavaria, aged 67. Her husband also died in the traffic accident. She is buried in an Ehrengrab (Honorary Grave) at the Heerstraße Cemetery in Berlin. “This small tough person does not need a monument. It already stands,” wrote the critic Friedrich Luft after her death in 1970. An Inter-City Express train on the route between Frankfurt and Hanover has been named after her, as well as a 100-Pfennig postage stamp from the permanent series Women in German History, which was dedicated to her in the year 2000. German postcard by Kunst und Bild, Berlin, no. A 999. Photo: Berolina / Constantin / Wesel. Publicity still for Hurra - ein Junge/Hurray, a boy (Ernst Marischka, 1953). East-German postcard by VEB Progress Film-Vertrieb, no. 32/331, 1957. Photo: Real-Film. Publicity still for Die tolle Lola/The great Lola (Hans Deppe, 1954). German postcard by Rüdel-Verlag, Hamburg-Bergedorf, no. 129. Photo: Junge Film Union / Saloga. German collectors card. Photo: Arthur Grimm / CCC-Film / Prisma. German postcard by WS-Druck, Wanne-Eickel. Photo: Arthur Grimm / CCC / Gloria. Sources: Mechthild Winkler-Jordan (FemBio), Rudi Polt (IMDb), Wikipedia and IMDb.